1 of 4 With a sharp knife, cut peel from one of the grapefruit and one of the oranges, avoiding as much white pith as possible. Cut half of the resulting peel into thin 1-inch strips; finely chop the second half. Combine all of the peel, baking soda and 1-3/4 cups water in a large saucepan. Bring to a boil; cover and reduce heat to medium. Simmer 18 minutes, stirring occasionally. 2 of 4 Meanwhile, with a sharp knife, cut off remaining peel and white pith from all of the fruit. Discard peel and pith. Following sections, cut fruit from membranes, working over a large bowl to catch any juice. 3 of 4 Add fruit sections, any reserved juice and the fresh-squeezed orange juice to peel in saucepan and bring to a boil. Simmer 5 minutes, breaking apart fruit sections with a wooden spoon. Stir in sugar and pectin. Bring to a boil. Reduce heat to medium-high and boil 5 minutes, stirring constantly, until sugar and pectin are dissolved. Remove from heat; stir in cloves. 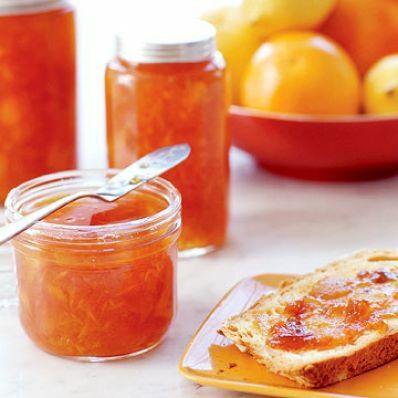 4 of 4 Carefully ladle or pour marmalade into five clean 1/2-pint jars with tight-fitting lids or divide between two larger jars or containers. Let cool, uncovered, to room temperature (about 1-1/2 hours). Screw on lids and refrigerate until cold. Store, refrigerated, for up to 3 weeks. Per Serving: 2 mg sodium, 0 g fiber, 37 kcal cal., 0 g sat. fat, 0 mg chol., 0 g Fat, total, 0 g pro., 9 g carb.